Visit the event page to learn more and RSVP for the Annual Manufacturers Meeting. On October 12, Governor Rick Scott activated the Florida Small Business Emergency Bridge Loan Program to assist small businesses impacted by Hurricane Michael. The Florida Small Business Emergency Bridge Loan is a short-term, interest-free working capital loan intended to help small businesses "bridge the gap" between the time of a declared disaster and when the business has secured long-term recovery resources. Eligible businesses with two to 100 employees may apply for interest-free loans between $1,000 and $50,000 for up to one year. The bridge loan is not designed to be the primary source of assistance for affected businesses, and as part of the eligibility requirements, businesses must indicate pursuit of other sources (including insurance claims and federal disaster assistance). The deadline to apply is December 7, 2018. Applicants must submit completed applications to their local Florida SBDC office. For more information, please visit FloridaDisasterLoan.org. If you have any questions about the Florida Small Business Emergency Bridge Loan Program, please contact the Florida SBDC Network at (850) 898-3479, toll free at (866) 737-7232, or by email at Disaster@FloridaSBDC.org. Additionally, businesses impacted by Hurricane Michael are encouraged to complete the Business Damage Assessment Survey Administered by the Florida Department of Economic Opportunity (DEO), this survey is not an application for disaster assistance, but assists state and federal officials in determining the extent of damage and need for federal disaster assistance. FloridaDisaster.org for shelters, emergency supply locations, boil water notifications, etc. Manufacturing Day in Florida was October 5, but manufacturing remains in focus all month long. To measure the impact of MFG Day and MFG Month, FLATE encourages all tour participants to upload event information to MFGDay.com. FLATE has created a a great MFG Day resource page where you can find both online and downloadable tour surveys, lesson plans, fact sheets, presentations, tour tips, graphics, and so much more. 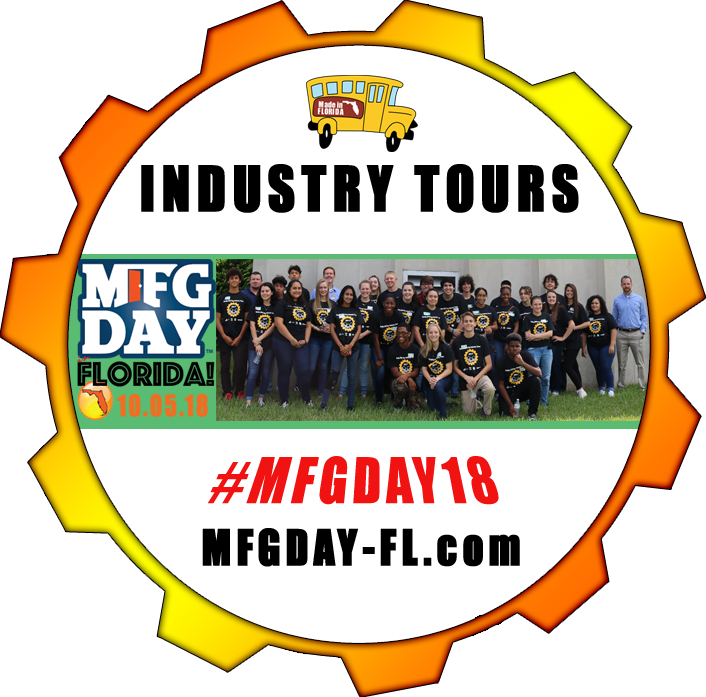 Since 2013, MFG Day tours have impacted more than 20,000 students in the state of Florida. Take a look at the 2013-2017 MFG Day summary data to learn more. The NWFMC is asking our educators for assistance with providing Manufacturing Academy enrollment data for the 2018-2019 school year. This information helps the Council track program success and identify any needs. If you are an educator and haven't done so already, please take a few moments to complete the 2018-2019 NWFMC Manufacturing Academy Enrollment Survey. ﻿Have an event you would like to add?